The Tayaran neighborhood is now under the “full control” of Iraqi forces, Maj-Gen. Haider al-Maturi said Sunday, according to AP. IS militants deployed at least 10 suicide car bombs, but only one of them reached its target. Two policeman were killed and five were wounded, al-Maturi said.Two militants, one of Iraqi decent and one foreigner who speaks Russian, were arrested. “We are clearing [the neighborhood] up and beefing up fortifications,” he added. 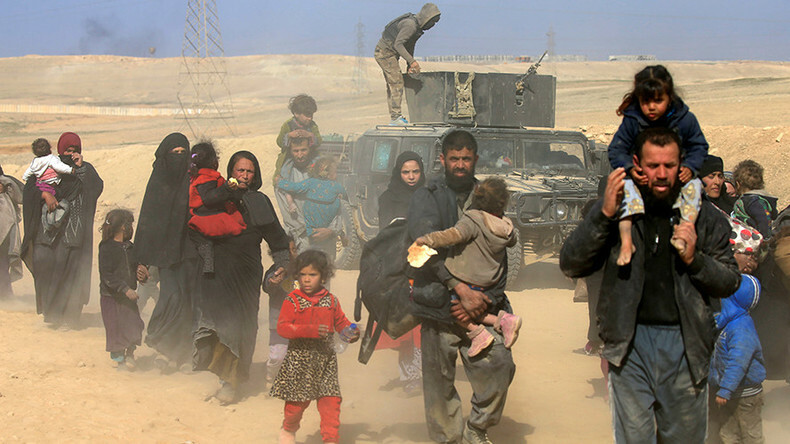 Nearly 3,000 people fled Mamun on Sunday, Iraqi special forces Brig-Gen. Salam Hashed said. Some 2,500 civilians fled the previous day. “The Iraqi security forces will have to take every precaution for civilian lives and civilian infrastructure, which means that we would plead that no heavy artillery is used, no heavy mortars are used,” Koek noted, also saying that civilians’ safety must be prioritized. “We hear stories of people going through incredibly dangerous journeys through territories that could be potentially mined,” Koek said, providing an example of a family of more than 10 people that managed to cross the frontline. The family decided to take their animals with them and had to use duct tape to keep them quiet. “Once people flee, once they manage to find a safe route out, they have access to a tent, to water, there will be medical services for people there and protection". The UN Children's Fund (UNICEF) and the UN World Food Programme (WFP) reported that families in Mosul are struggling with a critical shortage of food and drinking water, with three out of five people using untreated water from wells for drinking and cooking. "Food prices in western Mosul are almost double those in eastern Mosul," said Sally Haydock, WFP representative in the country, according to the UN News Centre. The Telegraph reported the heartbreaking story of a two-month-old baby girl who was killed in an explosion that destroyed the home of her family. Her relatives buried her in a grave among the rubble of other destroyed buildings, after holding a makeshift funeral ceremony. By UN estimates, between 750,000 and 800,000 civilians are in Mosul’s western districts. The United Nations says up to 400,000 people may have to leave their homes during the new offensive as food and fuel runs out in western Mosul. If so, the number of the displaced people would be twice as big as it was in eastern Mosul. “Yesterday, some 350 people arrived at a screening site in Hammam al Alil, some 30km southeast of Mosul, having left their homes in Abu Saif village and surrounding areas near Mosul city airport,” UN spokesman Stephane Dujarric said Friday. “Almost 162,000 people are currently internally displaced as a result of fighting in Mosul,” he added. In January, when east Mosul was recaptured, the UN reported that almost half of all the casualties were civilians. Iraqi government forces are aiming to win back a bridge across the River Tigris that would link the west bank with the already retaken eastern part of the city, Reuters reports. The move would shift the operation to its most active and, as aid and human rights organizations have warned, most dangerous phase. The bridge along with four others was damaged both in US-led airstrikes and by Islamic State militants. It is to be mended by army engineers that would allow to bring in reinforcements and supplies, Colonel Falah al-Wabdan of the Interior Ministry's Rapid Response unit said, Reuters reported Sunday. The combat operation in heavily populated west Mosul, containing the old city with its narrow alleyways, is expected to be a tough challenge for Iraqi forces. The narrow streets won’t allow armored vehicles and tanks to go through, so the fighting is likely to turn into hand-to-hand combat, which puts civilians in much greater danger. On Wednesday, UN Humanitarian Coordinator for Iraq Lisa Grande told RT that she is “deeply concerned” about the dire threat the civilian population faces as the offensive goes to west Mosul. “Even before the fighting began in many of the districts, there was already a humanitarian crisis in western districts,” Grande said, referring to soaring food prices, the lack of electricity and medicine. Annie Machon, a former MI5 intelligence officer, told RT that the battle for west Mosul is likely to bring a great number of casualties, both among civilians and soldiers. “I think west Mosul will be an incredibly difficult nut to crack, because it’s a very ancient city, there are a lot of small alleys and armed vehicles can’t go down those narrow alleys. There will be collateral damage, there will be civilian deaths,” Machon said Tuesday. IS fighters have reportedly set up a network of tunnels that would allow them to easily hide, watch over Iraqi soldiers and easily blend in with local residents. 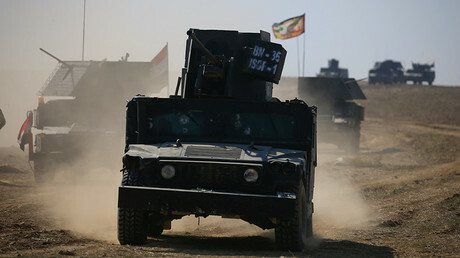 On Thursday, Iraqi forces managed to capture the city’s airport, which is expected to be used as a support zone. 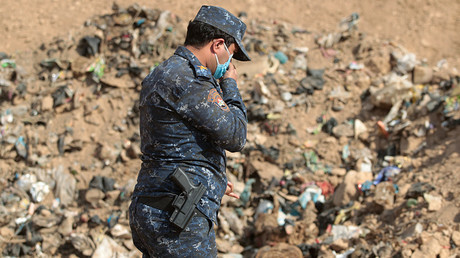 Earlier this week, nearly 4,000 people killed by IS militants were found buried in the Khasfa sinkhole located near the Baghdad-Mosul highway, not far from Mosul, The Telegraph reported, citing police, activists and local residents. Up to 6,000 IS militants could be inside Mosul, according to Iraqi forces’ estimates at the start of operations, Reuters reported. Nearly 3,300 have been killed in the battle so far.